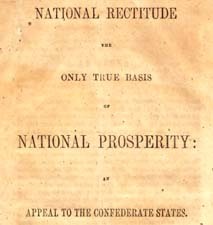 Joseph C. Stiles (Joseph Clay), 1795-1875 National Rectitude, the Only True Basis of National Prosperity: An Appeal to the Confederate States. National Rectitude, the Only True Basis of National Prosperity: An Appeal to the Confederate States. Petersburg: Evangelical Tract Society, 1863.